Ski touring in Fjord Norway. If you are into ski touring, you have every reason to visit the fjords in western Norway in late winter and spring. Find your fjord destination and go get that fresh powder snow. Grand views, thick snowfall, amazing peaks and easy logistics are a few benefits for backcountry adventurers who choose the Fjord Norway region. With hundreds of alpine peaks over 1,000 metres, it is perfectly possible to make fresh tracks every day of your trip. The skiing season often starts as early as November, but the high season for ski touring is spring, until the middle of May. This is when you get views of white mountains, green mountain sides and blue fjords. On the other hand, if you go earlier, you have a better chance to experience dry snow all the way down to sea level. You may recognize the scenery from your favourite freeride movies. The fjord and mountain landscapes frequently form the backdrop in films by renowned producers like Nuit De La Glisse, Warren Miller and SalomonFreeSki, to name but a few. Stay in a cosy, remote mountain lodge or hotel, or choose a ski and sail adventure that combines boat accommodation with some nights onshore by a fjord. It is easy to get here by plane to the international airports in Bergen or Ålesund. It is also good to know that there are several local skiing resorts in the area, which provide great skiing if the weather doesn’t hold for ski touring. 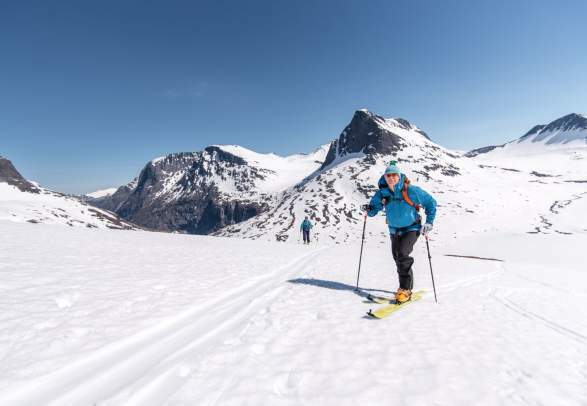 It goes without saying that the varied landscape of fjords, mountains and coastline in this part of Norway offers world-class ski touring opportunities. Located in the fjord area of western Norway, Nordmøre is ideal for a ski touring challenge in some of most scenic terrain the country has to offer. Combine unique skiing adventures with beautiful alpine mountains and idyllic fjordscapes in Sunnmøre. With grand fjord views and some thirty summits to choose from, the mountains in Sognefjord and Nordfjord offer terrific potential for ski touring. Combine an unforgettable ski touring experience with a truly spectacular train journey on the Flåm railway. Get a glimpse of the ski touring opportunities in Fjord Norway in these short films.